"I would just like to thank you for this wonderful game. Played twice, once with adults and once with kids. The adults took a while to get into it but eventually got there (I think after the alcohol started flowing), but the kids were magnificent and got into their characters really quickly with some sussing the murderer after only 20 minutes. Everyone thoroughly enjoyed themselves and keep asking when the next one will be." "My daughter's Hollywood Lies party was a HUGE hit with her friends. They came in their "dazzle wear"; we even had the "red carpet" leading up to our door for the guests. It was fun for them. The concept of the game is great for this age group -- they had to mingle and talk to one another. No wallflowers were allowed!" "I don't think I've ever laughed so hard." "Just played Hollywood Lies (kids version) for my daughter's 13th birthday party. It is the first unscripted party I have run and I was concerned. It was fabulous and the timings were great. Can't believe we managed to keep all those teenagers involved for 4 hours. Many many thanks!" "I played Hollywood Lies at my school, it was really fun. I played Sam Cortinelli." "I loved the first game we played of yours... Hollywood Lies. Best night of my life... my husband and I attended and only knew 2 people there. By the end of the night we knew 30 more people -- all by their Hollywood Lies names! It was fun running into them various places and using our "stage" names. We loved it so much we always wanted to host our own. So now we are [Casino Fatale]." "We tend to go away as a group of 20+ every year or so, and one of the highlights of our holidays has always been the murder mystery night. Hollywood Lies took it to another dimension. It was fantastic." "Overall, Hollywood Lies was an incredibly fun night and everyone had a great time. Thank you for providing such a detailed hosting package. It was very thorough and made it so much easier to host!" "I thoroughly enjoyed playing Hollywood Lies, easy to find suitable clothing, it was very easy to find appropriate themed decorations. The making movies and watching them was fun and a good laugh." "I have played in A Heroic Death and Arabian Nights, so I decided to host Hollywood Lies for my 13th Birthday Party. I added in custom 'weapon' cards to make the game more exciting and everyone had a blast! I've already told everyone I'm doing it again next year!" "We had so much fun playing Hollywood Lies and I am pretty sure I won mother of the year for hosting it. :) I think the kids all did a fantastic job with their roles. We will definitely come back to you for another game. Thanks! Here's a video we made for the game, in the form of a trailer." "We did Happy Birthday R.J. game 10 years ago for my husband's 30th birthday – it was so much fun! So I am surprising him with Hollywood Lies for his 40th! Your games are fun and so well laid out." "Hollywood Lies was exactly what we wanted on New Year's Eve, a gala murder mystery. The guests haven't had that much fun at a party in years!" 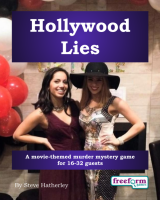 Hollywood Lies is a dinner party murder mystery game for 16 to 32 guests and one or two hosts – download the free introductory pdf file. Join us in a thrilling evening of scheming, intrigue and skulduggery. You will be in the middle of the action and it will be up to you to wheel and deal with the other guests. Can you achieve your goals, keep your secrets hidden and survive Hollywood Lies? It's up to you. It's award night and Tom Speed's latest film, Dazzled to Death, has just swept the board and garnered four Erics – for Best Picture, Best Actor, Best Director and Best Screenplay. Sadly, Tom Speed's award for Best Actor was accepted posthumously by his friend, Hayden Vicars, as Tom was killed in a driving accident late last night. Despite this note of sadness, celebrations are in full swing at the Dazzled to Death post-award party. Deals are being cut for future productions and everyone is having a good time enjoying the atmosphere and mingling with Hollywood's movers and shakers. Is there anything suspicious about Tom Speed's death? Who will win next year's Erics? Find out at Hollywood Lies. Hollywood Lies lasts for about four hours and is suited to an evening. It is often played over a meal – a finger buffet if possible to allow guests to circulate and talk in private. "I just hosted Hollywood Lies for a group of teen homeschoolers this weekend. I have to say that they had a blast! Their "movies" were a hoot! This is the 3rd year in a row that we have used your games as sort of an ice breaker for the kids to get to know one another. As usual, it was a great success. Thanks again!" The free introductory pdf file contains an introduction to the game and a cast list of all the characters – plus details of how to buy the game. Important note: Hollywood Lies is an alternative version of one of our other games, Halloween Lies. The characters and the plots are the same, so if your guests have previously played Halloween Lies, they'll know the secrets of Hollywood Lies too! The difference is that Halloween Lies is written specifically for a Halloween party, while Hollywood Lies is suitable for any time of year. Ash d'Lessey – Award-winning director of Dazzled to Death. Bernie Newman – Has come to Hollywood to become a movie star. Bobby Treveeno – Entertainer of the old school. Cass Dockery – Works for a small independent movie financier, but is looking to break into acting. Charlie Henderson-Plum – Played Skipper Primley, Dazzled to Death's British villain. CJ Vasquez – One of Dazzled to Death's co-producers. Claude Janvier – Composer who recently wrote the music for Ash d'Lessey's Bludgeoned on Broadway. Detective Arden Chase – One of Hollywood's finest detectives. Eddie Flax – One of Hollywood's many agents. Evrim Meric – Bit-part actor with a minor role in Dazzled to Death. Ghana Moon – Award-winning screenwriter of Dazzled to Death..
Hayden Vicars – Co-producer of Dazzled to Death and Tom Speed's friend. Hunter Sharp – Independent film producer and director. Jackie Simpson – Actor fired from Dazzled to Death before filming started. Jam Lafayette – Owner of the Sacre Bleu! restaurant and TV celebrity chef. Joss Dawson – In the business a long time, first as an actor and now as an agent. Jules Milton – Manager of Spangles Hotel. Les Tytan – Mesmerist whose clients have included Charlie Henderson-Plum and Mel Cutter. Lou Egan – Respected Hollywood film director. Luca Delmonico – Comes from a very wealthy family and recently appeared in the movie Davy Jones' Locker. Max McNab – Bit-part actor struggling to get into the big time. Mel Cutter – The author of 'Cutter's Comments', a notorious newspaper column in the Hollywood News. Morgan Beech – Star of blockbuster movie Dazzled to Death. Nat Rankin – Character actor who recently appeared in Davy Jones' Locker as a villain – as usual. Pip Slater – One of Hollywood's many agents. Ronnie Manfred – Character actor who often plays evil henchmen. RT Markovitz – Press photographer for The Big Cheese, a newspaper. Sam Cortinelli – One of Dazzled to Death's stunt doubles. Sam is rumored to have 'family' connections. Shelly Wells – Owns TrixieCorp, a large corporation, but is now producing a movie. Terry Ford – Character actor who played Hatch, a bodyguard, in Dazzled to Death. Toy Shepherd – Comedian from the East Coast. Val Taylor – Actor and producer, co-producer of Dazzled to Death..
All the characters are of neutral gender, so they can be played by any mix of men or women guests as required. Hollywood Lies is unlike many murder mystery games. Although the game starts with a murder, most of the characters have more important things to do than to investigate it. And the killing may not be over – it is unlikely that everyone will survive the remainder of the evening! Hollywood Lies is played just like a murder mystery game. You may be trying to solve the murder, but primarily you are (initially at least) concentrating on your own goals and objectives. Unlike most boxed murder mystery games, Hollywood Lies lets you decide how to achieve your goals and thwart your enemies. "Hollywood Lies went just perfect and everyone enjoyed themselves (we had 13 teenagers and 3 adults). It was just excellent!" On the evening of the game the guests are met by the organizer, the Master (or Mistress) of Ceremonies. They then receive their detailed backgrounds - including dark secrets, objectives and money. The players can form alliances, blackmail each other, steal items and even try to make the best movie for next year. Along the way they may solve some of Hollywood Lies's mysteries. What is the Post-Modern Freeform Movement up to? Who will get tickets to the charity ball? What really happened on the set of Snow Business? Which script will be made into a movie? And of course, how did Tom Speed die? Finally, the game concludes and everyone finds out how they did, and what secrets everyone else was concealing. Hollywood Lies costs £30.00 (GB pounds) or US $49.99. You can buy it in either currency, from anywhere in the world, as you prefer. The price will be converted back into your own currency for you, at today's exchange rate. We offer a Cast Iron Guarantee on all our murder mystery games. If you're not completely satisfied with Hollywood Lies then please let us know within 30 days and we will refund you. See our full terms and conditions here.